In the past five years, I have really embraced garment sewing. I learned to sew a young age and began by sewing simple garments. They weren't that great, but I applaud myself for at least trying. In high school and college I took a break from garment sewing and did a lot of quilting. I was also a fibers major in college, so I was doing a lot of weaving at that time in my life. It wasn't until I started working at Fabric Mart in 2008, that I really embraced garment sewing again. Seeing so many beautiful fabrics was really inspiring. But you know what I remember most about sewing? My first project! It was the summer I was going to 2nd grade. My aunt would watch my brother and I every other tuesday. One week I made nautical print shorts for my brother. 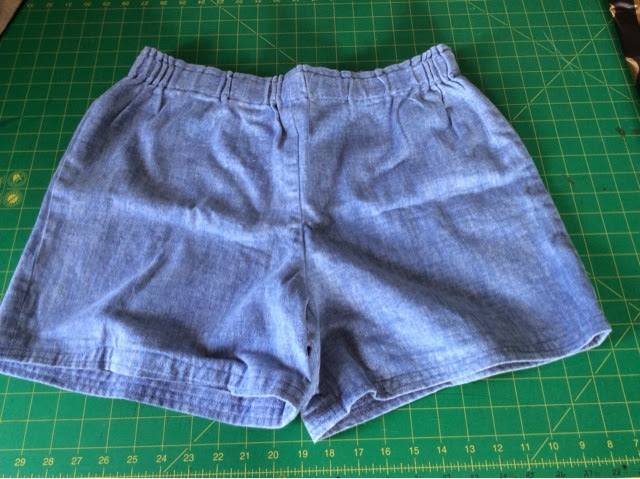 The next week I made denim shorts for myself! The fabric was from my grandmother's fabric stash. I cut it strictly from the pattern. No alterations or anything. The top band had elastic. How much easier can it get? My aunt guided me through the process and I have to say I didn't do too bad! When I was cleaning my sewing room a few weeks ago, I found the shorts! I was always on the bigger side than everyone else growing up, so the shorts are actually large enough that I could probably still wear them. I will never get rid of these shorts, it's a huge memory in my life and one that I can share with my children and grandchildren. Plus I have something to prove it! Do you still have your first sewing project? What was it? How old were you when you made it? Tell us your story! If you would like to share your first sewing project with our readers, email fabricmartblog@gmail.com with photos and a description and/or story behind the project. We'd love to share your story! That is a nice memory and an impressive pair of shorts for a little girl to make! That's amazing that you accomplished that at such a young age. Kudos to your aunt for her guidance. Made by a Fabricista: You're Gonna Hear Me Roar! !